Limassol offers, through its beautifully designed pedestrian path along the coastline a wonderful experience; walk along with the history of the city, from antiquity to the early 20th century, take a break at a local coffee shop and sip a «metrios» and a cold glass of water, learn about the history of the shore line and its people, the numerous conquerors, the battles, the love stories that formulated the history of this unique island of the Eastern Mediterranean. 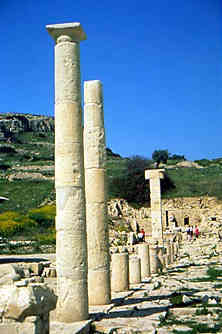 Amathus is a special city inhabited since the 11th century B.C. and destined to become one of the leading states of the Cypriot Iron Age, no less powerful and prosperous than the Greek city kingdoms. Since the dawn of its day the city traded with both Greek and Levantines, accepting and receiving ideas from both worlds. Continuing your walk you come across the walls of the ancient city of Amathus. Walking along the pathway you can see the inner and outer harbour,at the lower level the Agora with its baths and other buildings, the basilica, the walls that surrounded the city, the palace, and high above the acropolis with the temple dedicated to Aphrodite, the byzantine basilica and the aqueduct. The city of Amathus and the surrounding ancient locations that flourished during antiquity and Byzantium were destroyed by the Arab invasions. Moving towards the west you come closer to the known area of the Harbour of Limassol. The old jetty still stands proud and part of the old harbour is used as a little marina for small fishing boats. The harbour has a long history as it was a main point of reference during medieval times. As the island fell to the Ottomans in 1571 the trade ceased, and the city together with the well known harbour fell to oblivion. It was only after the arrival of the British in 1878 that the harbour acquired its old glory. The wine factories flourished and exports were made to the Middle East and Europe, all from the harbour of Limassol. Limassol became a pioneer industrial city and set the standards for the rest of the island. Walk further down the road to the Zoo, it won’t be long before its gone, take a look at the Public Gardens, take a swim and a break for some fresh orange juice, and visit the old Stadium of Limassol and the Catholic church, gaze at the buildings of the beginning of the century that house today various activities. All that happens in Limassol happens on this main road. The Carnival in February, the Flower Celebrations in May, and the Wine Festival in September. Limassol is a town that lives aloud.